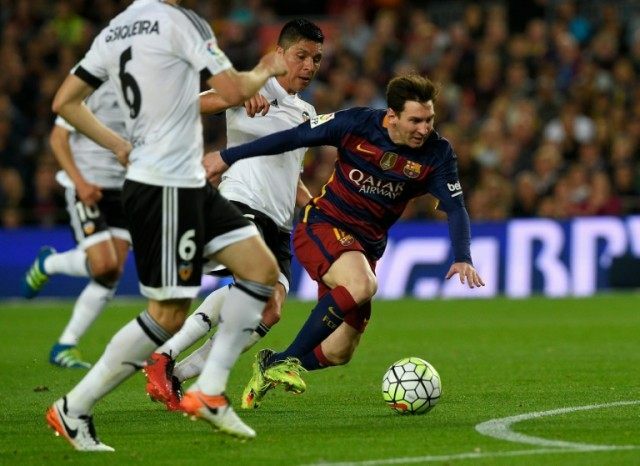 Madrid (AFP) – Lionel Messi’s 500th career goal couldn’t prevent Barcelona’s incredible slump in form from continuing with a fourth defeat in five games 2-1 at home to Valencia on Sunday. Valencia were beaten 7-0 by Barca on their last trip to the Camp Nou just two months ago, but gained revenge thanks to Ivan Rakitic’s own goal and Santi Mina’s classy finish before half-time. The Brazilian blocked Messi’s volley from close range before somehow springing to punch away Neymar’s lob which seemed destined to evade him. Valencia had already served a warning of the threat they could cause on the counter-attack when Rodrigo side-footed inches wide from the edge of the area. However, they amazingly went in at half-time two goals to the good having had just one shot on target. The visitors went in front on 27 minutes when Rakitic turned Guilherme Siqueira’s cross into his own net at the near post. Alves produced another brilliant save to parry Messi’s downward header moments later, but Valencia doubled their lead thanks to a brilliant move in first-half stoppage time as Dani Parejo played in Mina to fire into the far corner. Rakitic had a huge chance to make amends for his own goal a minute into the second-half, but pulled his effort tamely wide from Luis Suarez’s fine cut-back. However, Barca were finally given hope when Jordi Alba’s low cross was turned home by Messi to reach another historic landmark. Alves came to Valencia’s rescue once more with his best save of the night low to his right to prevent Rakitic equalising 15 minutes from time. Neymar’s fiercely struck volley was somehow deflected behind by Shkodran Mustafi, but Valencia should also have killed the game off at the other end when Paco Alcacer miscued from point-blank range allowing Sergio Busquets to clear off the line. Gerard Pique then had a glorious chance to salvage at least a point, but he pulled his shot wide with just Alves to beat. In contrast to Barca’s collapse, Atletico are flying in the final stages of the season as Fernando Torres struck his fourth goal in as many games in a routine win over Granada. “It will be tough (to win the league), but we will play as the schedule demands us to which is to win, win and win again,” said Atletico boss Diego Simeone.